Make A Raspberry Pi Camera-Based Microscope Using LEGOs #piday #raspberrypi @Raspberry_Pi « Adafruit Industries – Makers, hackers, artists, designers and engineers! 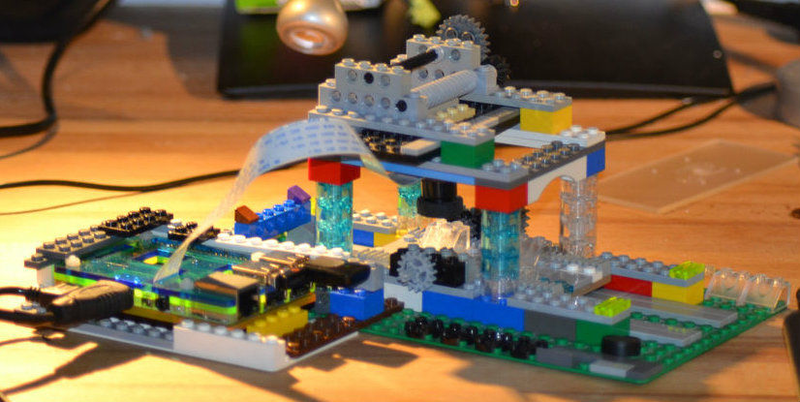 A Raspberry Pi camera-based microscope, built just from LEGO parts. – a Raspberry Pi 2 running on Raspian, with Python and Mathematica installed; a LG monitor, a Logitech K400R keyboard. four M2 x 10 mm screws and eight M2 nuts, used as spacers between camera and a 4×4 LEGO plate. – a bit of hyperthermoplastic plastic to glue the camera/screws to a LEGO plate. Standard hot glue will work as well. – a selection of LEGO parts I found in my son’s room. Nothing really unusual, but a few LEGO technics parts as toothed racks, gear wheels and worm gear are part of the construct. – a LED desktop lamp with a goose neck for illumination.